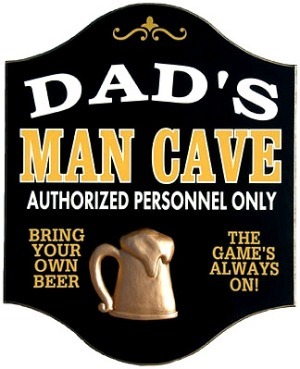 Durable, affordable and attractive, this Dad's Man Cave Pub Sign with a 3D Gold Beer Mug is made of real wood, has a black background with a routed gold pinstripe edge, is 18 in. x 14 in. and comes ready to hang. This high quality Man Cave wall sign is ready to ship immediately from our store. It is meticulously handcrafted by a third party company in the USA and it is not reproduced in a factory setting by machines. This sign should only be hung indoors. PROCESSING/SHIPPING: Approximately 1 business days for processing (2 days during the holiday season) and 2-6 business days for shipping. NEED IMMEDIATELY? See IN A RUSH?. See Holiday and Father's Day Shipping Schedule in May, June, November & December. ABOUT THIS SIGN: The third party wood sign company that makes this sign uses top quality materials. Each piece is unique and one of a kind. To complete the look of this sign, it is given a hand rubbed stain to "age" the sign appropriately. The majority of our wood signs are intended to have a weathered look. Therefore on occasion, you may notice a slight color, indentation, perhaps a tiny smudge, scratch or other small variation. These variances & imperfections are not considered manufacturing defects. They are evidence of an original, unique, one of a kind, handcrafted, hand painted piece of artwork created by artisans. Learn more about the quality of these wood signs & how they are made.